Jurassic World asks the question: What is the liability for a zoo full of dinosaurs that start eating people? Seriously, who is their insurance carrier? Exactly how big was the retainer for the law firm representing them? Are there plaintiffs law firms that specialize in dinosaur bite cases? Do state bar associations offer certifications in dinosaur law? Will Jurassic World at least have one lawyer who does not get eaten by a dinosaur this time? (a) Except as provided in (b) of this section, a person who owns or operates a zoo is strictly liable for injury to a person or property if the injury is caused by an animal owned by or in the custody of the zoo. (3) The enclosure within which the animal was confined at the time of the injury was constructed and maintained in a manner that prevents a person who exercises ordinary care customary for a person of similar age, intelligence, and experience from contacting the animal or entering the enclosure. Zoos have had plenty of litigation with animals that have attacked human beings. Take a case from 1925, where a zoo had a bear chained to a tree for a feeding. A visitor walked up to the bear and fed the candy. The bear bite the plaintiff’s hand and “threw the visitor to the ground and tore flesh from her leg and hand.” Byrnes v. Jackson (1925) 140 Miss. 656, 665. It cannot be the law that the city can place in its parks ferocious and dangerous animals by which the safety, and even the lives, of the public would be endangered without requiring the city to keep such animals securely confined. As a general rule persons having animals wild by nature and of ferocious disposition are required to keep such animals confined absolutely, or pay for any damage sustained by a failure so to do. Judge Ethridge, Supreme Court of Mississippi, Byrnes v Jackson, at *670. The Supreme Court of Mississippi held that the city was strictly liable for the zookeeper’s negligence in having a bear chained to a tree. Id. With that as a primer for the movie, get ready to eat lots of popcorn during Jurassic World. 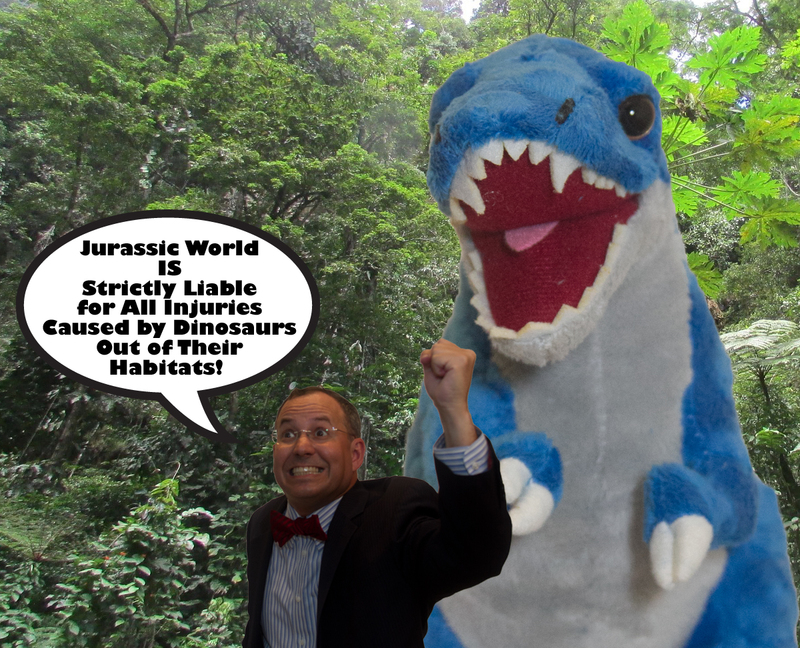 Can Law Find a Way to Save the Dinosaurs of Jurassic World? Could Velociraptors Be Used in War?